The return of Big Brother lit up CBS’ prime-time ratings while also giving the network rare dominance among advertiser-coveted 18-to-49-year-olds. Wednesday’s two-hour chunk drew 185,175 total D-FW viewers and 78,015 in the 18-to-49 realm. Both were prime-time pacesetters. Another one hour of BB on Thursday likewise led all prime-time TV attractions, with 163,808 total viewers and 68,653 in the key 18-to-49=year-old demographic. Aided by BB’s tail wind, CBS’ Code Black won Wednesday’s 9 p.m. hour in both total viewers (135,320) and with 18-to-49ers (31,206). Thursday’s 9 p.m. winner was Fox4’s local newscast, which pulled in 135,320 total viewers and 46,809 in the 18-to-49 age range. On Wednesday morning, Fox’s presentation of the Mexico-Sweden World Cup soccer match averaged 78,343 total viewers and 31,206 in the 18-to-49 demographic. Spanish language Telemundo again greatly exceeded those numbers with its Mexico-Sweden coverage, which had 242,151 total viewers and 109,221 within the 18-to-49 motherlode. Mexico lost 3-0, but survived into the “knockout” round of 16 when South Korea upset defending champ Germany 2-0. Here are the Wednesday-Thursday local news derby results. Wednesday -- TEGNA8 ran first at 10 p.m. in total viewers while NBC5 won among 25-to-54-year-olds (main advertiser target audience for news programming). Fox4 waltzed to another pair of 6 a.m. wins and the Peacock ran the table at 5 p.m. The 6 p.m. golds went to TEGNA8 in total viewers and Fox4 with 25-to-54-year-olds. Thursday -- TEGNA8 again won at 10 p.m. in total viewers, but Fox4 took the 25-to-54 top spot. Fox4 remained master of the 6 a.m. domain by extending its multi-month unbeaten streak. NBC5 again took both 5 p.m. firsts. At 6 p.m., CBS11 ended a lengthy winless drought by prevailing at 6 p.m. in total viewers. Fox4 again paced the 25-to-54 ratings. NBC continues to dominate D-FW’s summer prime-time ratings with its weekly double shot of America’s Got Talent. Tuesday’s two hours easily topped all-prime programming with 327,617 viewers and 81,136 within the advertiser-prized 18-to-49-year-old sweet spot. The Peacock’s followup World of Dance then tied Fox4’s local newscast for the 9 p.m. win in total viewers (128,198 apiece) but was nipped by the news in the 18-to-49 realm (43,688 viewers to 40,568). TEGNA8 took the total viewers crown at 10 p.m. while Fox4 had the most 25-to-54-year-olds (main advertiser target audience for news programming). Fox4 lengthened its multi-month 6 a.m. winning streak with another pair of firsts. TEGNA8 won at 6 p.m. in total viewers and shared the 25-to-54 spoils with Fox4. NBC5 broke through to sweep the 5 p.m. competitions. Picking up a little steam as the summer gets steamier, ABC’s two-hour Monday edition of The Bachelorette smelled like a rose in both major ratings barometers. It paced all prime-time programming in D-FW with 163,808 total viewers and 68,653 in the advertiser-coveted 18-to-49-year-old demographic. CBS’ competing 8 p.m. Season Two premiere of Salvation managed a second place finish at that hour in total viewers (92,587) but plunged to last place among the Big Four broadcast networks with just 9,362 viewers in the key 18-to-49 age range. Fox4’s 9 p.m. local newscast won the 9 p.m. hour in total viewers (156,686), but ABC’s The Proposal lured the most 18-to-49ers (43,688). TEGNA8 took the 10 p.m. golds in both total viewers and with 25-to-54-year-olds (main advertiser target audience for news programming). Fox4 cruised to another 6 a.m. sweep and added 5 and 6 p.m. wins with 25-to-54-year-olds. TEGNA8 drew the most total viewers at both 5 and 6 p.m.
Mexico’s 2-1 win over South Korea late Saturday morning kicked into high gear on Fox and Telemundo. The two stations combined to draw the biggest numbers for any of D-FW’s weekend TV attractions, with Telemundo’s Spanish language version outdrawing Fox’s English language presentation in both total viewers and advertiser-prized 18-to-49-year-olds. Airing from 10 a.m. to noon, Mexico-South Korea drew 306,250 total viewers on Telemundo and 192,297 on Fox for a grand total of 498,547. Among 18-to-49-year-olds, Telemundo pulled in 143,548 viewers and Fox had 84,256 for a combined 227,804. The percentage of 18-to-49-year-olds is close to the magic 50 percent the NBA achieved during its postseason. Nationally, Telemundo has drawn more than 7 million total viewers for both of Mexico’s matches in the 2018 World Cup. The team takes on Sweden Wednesday morning. Sunday’s prime-time pacesetters were CBS’ 60 Minutes in total viewers (199,419) and ABC’s To Tell the Truth in the 18-to-49 age range (37,447). On Friday, CBS’ Blue Bloods rerun led the prime-time parade in total viewers (128,198) and NBC’s Dateline drew the most 18-to-49ers (24,965). Fox4 won at 6 a.m. and 10 p.m. in both total viewers and with 25-to-54-year-olds (main advertiser target audience for news programming). NBC5 likewise swept the 5 p.m. competitions and added a 6 p.m. win with 25-to-54-year-olds. TEGNA8 drew the most total viewers at 6 p.m., but registered “hashmarks” (no measurable audience) among 25-to-54-year-olds for its 5 p.m. news. The NBA’s annual draft, with the Dallas Mavericks figuring prominently in the early going, cleaned up Thursday night among the viewers that most ad buyers most care about. Its first round, running from 6:30 to 9:45 p.m. on ESPN, averaged 49,930 D-FW viewers in the key 18-to-49-year-old demographic, more than half the overall audience of 85,465. The 18-to-49 score was the night’s highest, with Fox4’s 9 p.m. local newscast placing second with 43,688. But a number of individual programs had more total viewers than the draft, led by CBS’ 7 p.m. repeat of the The Big Bang Theory (206,541 viewers). ABC’s 9 p.m. premiere of Take Two, a Castle lookalike from the creator of Castle, drew 121,076 total viewers to rank second in its time slot behind Fox4’s news. Among the Big Four broadcast networks, it also took the runner-up spot among 18-to-49ers with 28,085. The 7 p.m. Season 2 premiere of ABC’s The Gong Show had 92,587 total viewers and 18,724 within the 18-to-49 motherlode. On Wednesday, Fox4’s 9 p.m. news led all prime-time attractions in total viewers with 192,297 while Fox’s Masterchef and Gordon Ramsay’s 24 Hours to Hell and Back also dominated their 7 to 9 p.m. slots with 185,175 and 163,800 viewers respectively. All three shows likewise easily won their hours with 18-to-49-year-olds. Wednesday -- TEGNA8 topped the 10 p.m. competitions in total viewers while Fox4 won among 25-to-54-year-olds (main advertiser target audience for news programming). Fox4 continued its multi-month winning streak at 6 a.m. with another sweep and also ran first at 5 and 6 p.m. with 25-to-54-year-olds. NBC5 won in total viewers at 5 p.m. and TEGNA8 drew the biggest overall crowd at 6 p.m.
Thursday -- TEGNA8 had an uncommonly big day, sweeping the 5 and 6 p.m. races and adding a 10 p.m. win in total viewers. The other spoils went to Fox4, which again ran the table at 6 a.m. and had the most 25-to-54-year-olds at 10 p.m.
After a little-watched Monday, D-FW’s prime-time ratings bounced back Tuesday via the sheer force of NBC’s America’s Got Talent. The latest two-hour edition of summer’s biggest hit easily ranked as the night’s No. 1 draw with 306,250 viewers and 65,533 within the advertiser-coveted 18-to-49-year-old demographic. The Peacock’s World of Dance then took the 9 p.m. hour with 180,901 total viewers and 59,219 in the 18-to-49 realm. ABC’s 9 p.m. entry, the second episode of The Last Defense, continued to lag despite the true crime doc’s focus on whether to reopen the case of Darlie Routier, the Rowlett mother who in 1997 was sentenced to death row for the in-home murder of her two young sons. Last Defense ran fourth in total viewers at 9 p.m. with 85,465 and inched up to third in the 18-to-49 demographic with 18,724 viewers. TEGNA8 took the top spot in total viewers at 10 p.m., but NBC5 won among 25-to-54-year-olds (main advertiser target audience for news programming). Fox4 chalked up two more wins at 6 a.m., won with 25-to-54-year-olds at 6 p.m. and tied TEGNA8 for first place in total viewers at that hour. The 5 p.m. golds went to TEGNA8 in total viewers and NBC5 with 25-to-54-year-olds. Monday’s prime-time Nielsens barely arose from a snore. Fox4’s 9 p.m. local newscast led all TV attractions in total viewers, but with just 142,442 of ‘em in a D-FW viewing market of 7.12 million. ABC’s two-hour edition of The Bachelorette ranked highest among advertiser-prized 18-to-49-year-olds -- with 46,809 in a market of 3.12 million. The premiere of ABC’s The Proposal limped into view with 85,465 total viewers and 34,327 in the 18-to-49 realm. Against this kind of competition, the lowly Texas Rangers became more competitive with a road win at Kansas City. The Fox Sports Southwest telecast averaged 99,709 total viewers but bogged way down with 18-to-49ers (15,603). TEGNA8 won at 10 p.m. in total viewers and with 25-to-54-year-olds (main advertiser target audience for news programming). Fox4 remained unbeatable at 6 a.m. in both ratings measurements, particularly obliterating the competition among 25-to-54-year-olds before winning by even more crushing margins from 7 to 9 a.m. against the three network morning shows. NBC5 swept the 5 p.m. competitions while the 6 p.m. firsts went to TEGNA8 in total viewers and Fox4 with 25-to-54-year-olds. Turn-off commentary by Fox’s Joe “What a shot” Buck and the absence of some of golf’s biggest names may have kept the ratings a bit down for Sunday’s final round of the U.S. Open. But a 15-minute segment, from 4:45 to 5 p.m., still drew the most Father’s Day eyeballs, with 213,663 D-FW viewers. The closing hour of last year’s Open drew 218,133 viewers. Overall, the Open averaged 128,198 viewers for Fox’s elongated coverage, with 43,688 in the advertiser-prized 18-to-49-year-old age range. The latter number also was enough to outdraw any other Sunday TV attraction in this key demographic. CBS’ 60 Minutes averaged the most total viewers overall (199,419). CBS’ 9 p.m. repeat of Blue Bloods led Friday’s time parade in total viewers with 135,320. Among 18-to-49ers, NBC’s American Ninja Warrior and ABC’s 20/20 ranked highest with 21,844 viewers apiece. TEGNA8 rolled to twin wins at 10 p.m. in total viewers and with 25-to-54-year-olds (main advertiser target audience for news programming). Fox4 swept the 6 a.m. competitions and NBC5 did likewise at 6 p.m. The 5 p.m. golds went to TEGNA8 in total viewers and NBC5 in the 25-to-54 age range. Fox4’s 5 and 6 p.m. newscasts again were wiped out by Fox’s U.S. Open coverage. Prime-time was a dry well Thursday until Fox4 hit a gusher with its 9 p.m. local newscast. It led the D-FW Nielsens in both total viewers (206,541) and with advertiser-coveted 18-to-49-year-olds (68,653). In both measurements, the news more than doubled the crowd for Fox’s preceding two hours of The Four: Battle for Stardom, which had just 71,221 total viewers and 24,965 in the 18-to-49 realm. Fox’s first round of the birdie-starved U.S. Open didn’t do much either, averaging 42,733 total viewers and a sub-puny 6,241 within the 18-to-49 motherlode. TEGNA8 drew the most total viewers at 10 p.m. and tied Fox4 for the lead among 25-to-54-year-olds (main advertiser target audience for news programming). Fox4 cruised to two more 6 a.m. wins while NBC5 swept the 5 p.m. competitions. At 6 p.m., TEGNA8 had the most total viewers and the Peacock won with 25-to-54-year-olds. Fox4’s 5 and 6 p.m. newscasts were rubbed out by U.S. Open coverage. After a brief sojourn in the Wisconsin homeland, your friendly content provider is back in D-FW mode with a week’s worth of ratings. Wednesday’s overall prime-time pacesetter, Fox4’s 9 p.m. local newscast, drew 192,297 total viewers while Fox’s 7 to 9 p.m. Gordon Ramsay combo, Masterchef and 24 Hours to Hell and Back, tied for the top spot among advertiser-prized 18-to-49-year-olds with 43,688 apiece. On Tuesday night, NBC’s America’s Got Talent easily led all TV attractions in total viewers with 341,861 and also comfortably won among 18-to-49-year-olds (96,739). Fox4’s 9 p.m. news took Monday’s No. 1 spot in total viewers (178,053) but lost the 18-to-49 crown to ABC’s The Bachelorette (53,050). CBS’ 60 Minutes climbed to the top of Sunday night’s total viewers heap with 242,151 while ABC’s Celebrity Family Feud won with 18-to-49ers (71,774). CBS’ annual Tony Awards ceremony clocked in at 142,442 total viewers and just 34,327 in the 18-to-49 realm. Justify won the Belmont Stakes and horse racing’s Triple Crown Saturday while also galloping past all other TV attractions with 327,617 total viewers during the 15-minute window in which the race was actually run on NBC. Friday night’s concluding Game 4 of the NBA Finals on ABC, won in a sweep by the Golden State Warriors over the Cleveland Cavaliers, averaged 384,593 total viewers and 199,718 within the 18-to-49-year-old demographic. Last year’s Game 4, in which the Cavs averted a sweep, had 407,182 total viewers and 205,254 in the 18-to-49 measurement. These are steady year-to-year downturns for each of the four consecutive Game 4s between these two teams. The first one, in 2015, averaged 488,180 total viewers and 268,073 in the 18-to-49 age range. In Thursday’s prime-time festivities, the Washington Capitals won their first ever Stanley Cup by defeating the first-year Las Vegas Golden Knights in Game 5 of their series. Shown on NBC, it drew 121,076 total viewers and 53,050 within the 18-to-49 motherlode. That was good enough to beat all prime-time programming among 18-to-49ers. But CBS’ rerun of The Big Bang Theory led in total viewers with 227,907. Here are the local news derby results for the five weekdays. Thursday -- CBS11 won at 10 p.m. in total viewers in a downsized three-way race; TEGNA8 had the most 25-to-54-year-olds (main advertiser target audience for news programming). Fox4 swept the 6 a.m. competitions and NBC5 scored twin wins at both 5 and 6 p.m.
Friday -- In another three-way 10 p.m. race, NBC5 won in total viewers and Fox4 was tops with 25-to-54-year-olds. Fox4 as usual ran the table at 6 a.m.
CBS11 ran first with total viewers at 6 p.m. while NBC5 won with 25-to-54-year-olds. The Peacock and TEGNA8 tied for the most total viewers at 5 p.m., with NBC5 winning outright among 25-to-54-year-olds. Monday -- All of the spoils went to Fox4 and NBC5. Fox4 ran the table at both 6 a.m. and 10 p.m. while NBC5 did likewise at 6 p.m. The Peacock also had the most total viewers at 5 p.m. while tying Fox4 for the lead with 25-to-54-year-olds. Tuesday -- TEGNA8 swept the 10 p.m. races and Fox4 continue to stretch its latest 6 a.m. unbeaten streak with another doubleheader win. NBC5 drew the most total viewers at 5 and 6 p.m. while Fox4 won at both hours among 25-to-54-year-olds. Wednesday -- Fox4 and NBC5 again smelled all the roses. 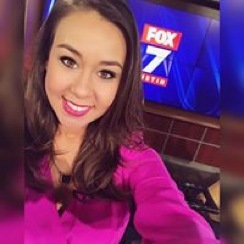 Fox4 had sweeps at 10 p.m. and 6 a.m., and NBC5 ran the table at both 5 and 6 p.m.
Ashley Paredez of Fox-owned KTBC-TV in Austin is joining Dallas-based Fox4 as a reporter for the early morning Good Day. Paredez replaces veteran Saul Garza, who left the station in May to become the city of Garland’s Social and Media Relations manager. Her first day will be July 9th. The University of Texas at Austin graduate joined KTBC in October 2013 after a previous stop at KFDA/KZBZ-TV in Amarillo, TX. She has a degree in broadcast journalism. On May 23rd, unclebarky.com, acting on a tip, asked Whitmeyer via a direct message whether the station would be hiring Paredez as an early morning reporter. She did not respond. 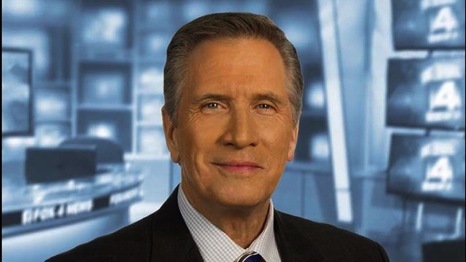 O’Kelley returning to Phoenix -- Featured CBS11 anchor Kaley O’Kelley, who left the station last month in search of a “better work/life balance,” is returning to Phoenix to anchor weekday early mornings at ABC station KNXV-TV. Her impending arrival, in early August, was announced in a KNXV memo obtained by the industry website FTVLive. O’Kelley briefly worked at KNXV in 2003 before joining rival KTVK-TV in Phoenix. She arrived at CBS11 in January 2015, joining incumbent anchor Doug Dunbar on the station’s 5, 6 and 10 p.m. newscasts. ABC’s Game 3 of the NBA Finals Wednesday night ended with the Golden State Warriors taking a 3-0 lead over the Cleveland Cavaliers, just as they did last year. Fueled by Kevin Durant’s MVP-worthy performance, the game ended precisely at 10:30 p.m. and averaged 427,326 D-FW viewers. That was down a little from last year’s third game, which had 450,808 viewers. This year’s Game 3 showed an increase, however, among advertiser-prized 18-to-49-year-olds, drawing 224,683 compared to last year’s 202,047. CBS11’s 10 p.m. local newscast was the overall runner-up TV attraction opposite Warriors-Cavs with 185,175 total viewers. Among 18-to-49ers, NBC’s 9 p.m. episode of Reverie ran second best with 31,206 viewers. On Tuesday, NBC’s 7 to 9 p.m. edition of America’s Got Talent comfortably led the prime-parade in both total viewers (284,884) and with 18-to-49-year-olds (74,894). Here are the local news derby results for Tuesday and Wednesday. Tuesday -- NBC5 swept the 10 p.m. competitions in both total viewers and among 25-to-54-year-olds (main advertiser target audience for news programming). Fox4 did likewise at both 6 a.m. and 5 p.m. TEGNA8 and CBS11 tied for the most total viewers at 6 p.m. while Fox4 won with 25-to-54-year-olds. Wednesday -- CBS11 flexed by winning a downsized three-way 10 p.m. race in both ratings measurements. Fox4 kept its latest lengthy unbeaten streak at 6 a.m. intact with another pair of firsts. TEGNA8 drew the most total viewers at 6 p.m. while NBC5 won with 25-to-54-year-olds. The 5 p.m. golds went to the Peacock in total viewers and Fox4 in the 25-to-54 realm. Fox4 sports anchor Mike Doocy will be adding/subtracting air time. Fox4 will adding a locally produced half-hour program weeknights at 10:30 p.m. in early September, with veteran sports anchor Mike Doocy a key player. In a staff memo obtained by unclebarky.com, Vice President/News Director Robin Whitmeyer dubbed the new program Free 4 All. “Get ready for opinion, guests and yes, sports,” she said. Doocy and a co-host yet to be named will “interact on any and all sports issues, events and even the ‘news’ of the day,” Whitmeyer said. The station will be dropping 10:30 p.m. repeats of Modern Family to accommodate the new show. Doocy also will be giving up something -- his 6, 9 and 10 p.m. sports segments on Fox4 newscasts in exchange for the new role. As reported by unclebarky.com just minutes earlier, Fox4 also will be expanding its Good Day program into the 9 to 10 a.m. hour this September. After recently expanding weekday editions of Good Day to a 4 a.m. start, Fox4 now is elongating the back end of the show as well. Starting in September, the Dallas-based station will extend the locally produced, No. 1-rated program to 10 a.m. while pushing the syndicated Live with Kelly and Ryan out of the 9 a.m. slot it has long held. It instead will air at 10 a.m. under current plans. “More 4 our viewers!” Vice President/News Director Robin Whitmeyer said in an email to staffers obtained by unclebarky.com. Sources say that Ryan and Przybyl likely will be starting their days perhaps one hour later while ending them a full hour later. Additional personnel to which Whitmeyer referred probably will be taking up the earlier hours slack rather than have the A-team on-camera for a grueling six straight hours. 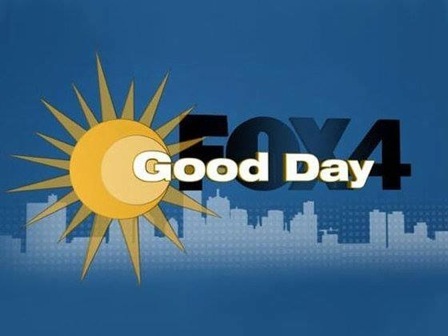 The featured 6 a.m. portion of Good Day, which draws significantly more viewers than the 4 to 6 a.m. portion, easily won the May “sweeps” ratings in both total viewers and with 25-to-54-year-olds (main advertiser target audience for news programming). The 7 to 9 a.m. portion of the show likewise dominated the competing network morning shows on ABC, CBS and NBC. NBC’s Today already extends from 9 to 10 a.m. ABC’s Good Morning America has announced it will be adding an extra hour in the fall, but it won’t air until 1 p.m. ABC affiliate TEGNA8 currently telecasts the homegrown Good Morning Texas from 9 to 10 a.m. while CBS has been running back-to-back episodes of Let’s Make A Deal during this hour. Barky and Barry’s Media Extravaganza is on the air -- both with the “pilot” and now a second episode newly recorded on Tuesday, June 5th. Barry had a long career as the DMN’s sports TV and radio columnist while also writing a number of in-depth features. My main beat for two-and-half decades was news and entertainment TV, plus the politics behind it. Together we now stand in hopes of bringing you unique and seasoned perspectives from two guys who pretty much have seen it all, but won’t be boring you with a series of “In My Day” rants. Our first collaboration is now on iTunes, which makes it seem pretty official. But our home base is Dallas-based Vokal Media, Inc., where both episodes are now available. You can listen to them here and here. Topics on these first two shows range from the new fall season to The Americans finale to the NBA Finals to a double dip with Roseanne Barr, whose ouster came just a couple of days after we discussed her hit Roseanne reboot among a wealth of other ones. Many thanks to our maestro, Ted Price, chief content officer for Vokal. We’re also in stellar company with some of Vokal’s other podcasters, who include D-FW mainstays such as Brad Sham, Ralph Strangis, Rick Gosselin and soon, Gina Miller. 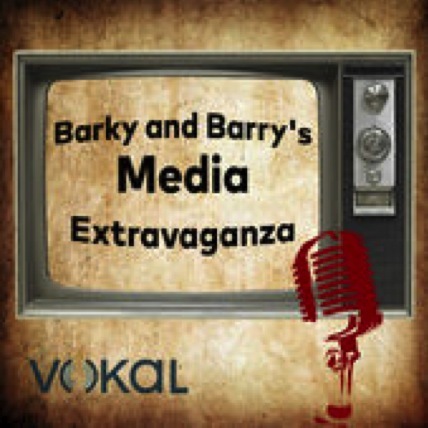 It’s all free of charge, but advertisers for Barky and Barry’s Media Extravaganza are most definitely welcome. It will help us to both stay on the air and keep Vokal thriving. Give us a listen, if you would. And let us know what you think. Barry and I are both on Twitter, and look forward to your feedback. ABC’s The Bachelorette rang the bell with advertiser-prized 18-to-49-year-olds while Fox4’s 9 p.m. local newscast drew Monday’s biggest overall crowd. Airing from 7 to 9 p.m., The Bachelorette sucked in 87,377 viewers of the 18-to-49 persuasion. Fox4’s news then scored with 192,297 total viewers to win that crown. Over on AMC, the 8 p.m. premiere of Dietland (with back-to-back one-hour episodes) was reduced to crumbs with just 14,244 total viewers and a sub-measly 1,872 within the 18-to-49 realm. TEGNA8 swept the 10 p.m. competitions with wins in total viewers and among 25-to-54-year-olds (main advertiser target audience for news programming). Fox4 likewise ran the table at 6 a.m. and had the most 25-to-54-year-olds at 5 p.m. NBC5 ranked first in total viewers at that hour. The Peacock and TEGNA8 shared the total viewers golds at 6 p.m., with NBC5 winning outright in the 25-to-54 demographic. Sunday night’s Game 2 of the NBA Finals on ABC reversed a downward trend in the D-FW ratings, but not for the Cleveland Cavaliers. The Golden State Warriors’ 122-103 win over the Cavs, which ended at 9:36 p.m., averaged 470,059 total viewers and 230,924 in the advertiser-prized 18-to-49-year-old age range. Both were ticks up from last year’s Game 2 between the same two teams, which drew 428,995 total viewers and 221,290 within the 18-to-49 realm. It’s the fourth straight Finals matchup between the Warriors and Cavs, with diminishing returns until Sunday’s game. The crazy events of Game 1 likely helped to boost attendance. Nothing else had much of a chance in Sunday’s prime-time Nielsens, particularly FX’s 8 p.m. premiere of the transgender-dominated series Pose. Set in 1987 New York City, the first episode had 14,244 total viewers and 3,121 in the 18-to-49 demographic. Friday’s prime-time festivities were led by Fox4’s 9 p.m. local newscast, which pulled in 135,920 total viewers. The leader with 18-to-49ers, CBS’ 7 p.m. hour of Undercover Boss, had 24,965 viewers. TEGNA8 won in total viewers at 10 p.m. while Fox4 led among 25-to-54-year-olds (main advertiser target audience for news programming). Fox4 also swept the 6 a.m. competitions and added 25-to-54 wins at both 5 and 6 p.m.
TEGNA8 drew the most total viewers at 6 p.m. and tied NBC5 for the top spot in this measurement at 5 p.m. Sparked by another mammoth game by LeBron James, a controversial foul call reversal and another typically bonehead play by J. R. Smith, Game 1 of the NBA Finals commanded Thursday’s prime-time ratings while also drawing fewer D-FW viewers than the 2017 opener. The fourth straight go-around between the Golden State Warriors and Cleveland Cavaliers, won 124-114 in overtime by the defending champs, averaged 455,814 total viewers on ABC, with 230,924 of them in the advertiser-prized 18-to-49-year-old age range. 2017’s Game 1 drew 501,706 total viewers and 237,325 in the 18-to-49 realm for Golden State’s 113-91 rout of Cleveland. CBS’ 7 p.m. repeat of The Big Bang Theory, which aired well before the game began, ranked as prime-time’s runner-up attraction Thursday in total viewers with 227,907 while ABC’s 7:30 p.m. pre-game show fared second-best with 18-to-49ers (68,653). CBS11 won in total viewers at 10 p.m., and Fox4 ran first with 25-to-54-year-olds (main advertiser target audience for news programming) in a downsized three-way race. Fox4 breezed to two more 6 a.m. wins and also swept the 6 p.m. competitions. The 5 p.m. winners were NBC5 in total viewers and Fox4 in the 25-to-54-year-old demographic.